It's an exciting time to be involved in quantum research. MITRE's Edlyn Levine should know. "The research I'm doing now is geared toward making fundamental scientific breakthroughs. It's exciting because it has the potential for creating game changers for our country." Levine conducts applied physics research—specifically, quantum physics—within the MITRE Innovation Program (MIP). The MIP awards independent funding to a select group of staff each year through a competitive process. Our goal: encourage researchers like Levine to pursue ideas in science and technology that can lead to breakthrough solutions for our sponsors. Quantum mechanics is the study of the behavior of matter and energy on the atomic and subatomic level. Simply put, it's the study of how the very smallest particles in nature—which the human eye can't see—move and dynamically interact. Harnessing the dynamics of quantum systems at the atomic scale could yield significant advances in quantum computing, communication, cybersecurity and cryptography, and other technologies. "Quantum is a growing field," Levine says. "And to be successful you have to be involved in research." She should know—she's involved in a range of quantum research projects. As a full-time researcher at MITRE's Bedford, Massachusetts, campus, Levine has established a research program on quantum sensing in partnership with faculty from Harvard University. Their work focuses on applying an emerging quantum sensing technology to high-impact problems for a safer world. "Our collaboration with Harvard crosses academia, government, and industry, and enables us to do research with world leaders in quantum sensing. It's helping us move closer to primary breakthroughs in technology applications." "Our Harvard partners have championed the type of quantum sensing technology that we're actually using in our work," she says. "It's a tremendous opportunity for MITRE and our sponsors." There are even bigger possibilities on the horizon. The partnership may contribute to fundamental knowledge of control and engineering of quantum systems, breakthroughs in quantum sensing, and quantum materials discovery and fabrication. Ultimately, these systems will be leveraged for quantum information processing in communications and computation applications—with the objective of developing a true quantum computer. Levine also leads a research effort focused on maintaining secure communications. This work draws on both classical and quantum communications. "All quantum communications systems require classical channels,"Levine says. For example, communications face challenges maintaining links in severely disturbed channel environments. Since communications systems transmit signals that interact with the ambient environment, they're vulnerable to natural and manmade disturbances. Levine works with new technologies to help protect and sustain secure communications over long distances. 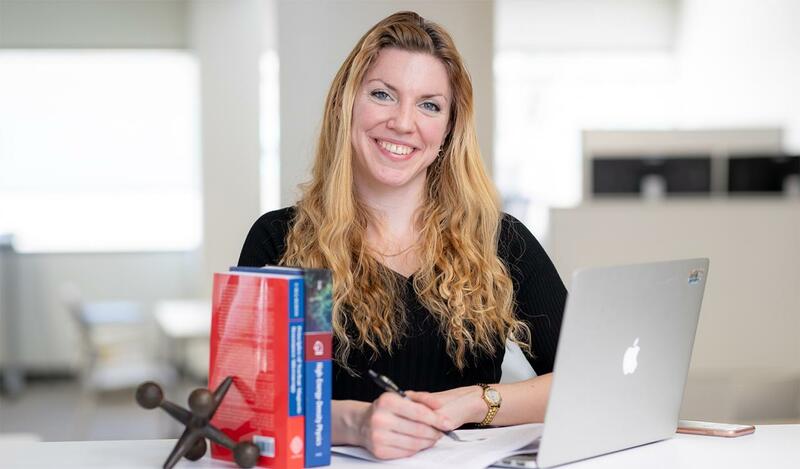 And her research takes advantage of another evolving field: plasma physics. “I lead research simultaneously in the fields of quantum information and plasma physics; there are not many physicists who do this,” Levine says. However, there are important parallels between the two fields that can inform cross-disciplinary breakthroughs. "Plasmas have resonances that resemble the resonances used to control quantum systems." Despite her busy work schedule, she quickly got involved with MITRE's outreach to students and faculty from nearby universities. She now co-leads MITRE's cross-corporate academic engagement team with colleague Jill Drury. "Our team builds on the enthusiasm of alumni at MITRE to foster relationships with universities," Levine says. "Those relationships help us develop recruiting and research collaborations." "The team hosted our second Technical Career Day in January," she says. More than just a recruiting event, it included technical presentations, lab tours, and a networking component. "Our goal is to attract the best and brightest to come work at MITRE. We take advantage of Bedford’s proximity to top-tier universities by bringing students on-site to interact directly with our staff and learn about our work." After the event, a university career counselor commented, "It was clear from everyone we spoke with and heard from that MITRE is a great place to work, with lots of opportunity to learn and make impact on exciting and difficult problems facing our country." And it's clear Levine enjoys extending her excitement about quantum physics beyond the laboratory to the next generation of researchers. Explore more at MITRE Focal Point: Cybersecurity.